Helping B2B companies identify business and regulatory risk in their customer base. If you’ve applied for a loan or opened a bank account online, you’ve likely gone through a screening process that involved answering questions about yourself, uploading a copy of your ID, and getting your credit checked. All-in-all, building trust between consumers and businesses has become standard and effective when engaging with online services. While this process is well understood for consumers, the process for establishing trust between the 30 million businesses in the U.S. is far less effective. When you consider that the U.S. has no central repository of businesses, that a business can be dissolved and reformed under a different name in a few days, and that 30% of businesses fail within their first two years¹, it’s not surprising that the average company writes off 2.1% of their revenue as uncollectable debt². With more than $1T³ spent between business online just in the U.S., the cost of bad debt exceeds $20B every year. This complexity, combined with a lack of best practices and antiquated tools results in companies either designing, implementing, and managing their own processes and tools for establishing trust with their customers, or foregoing due diligence all together. 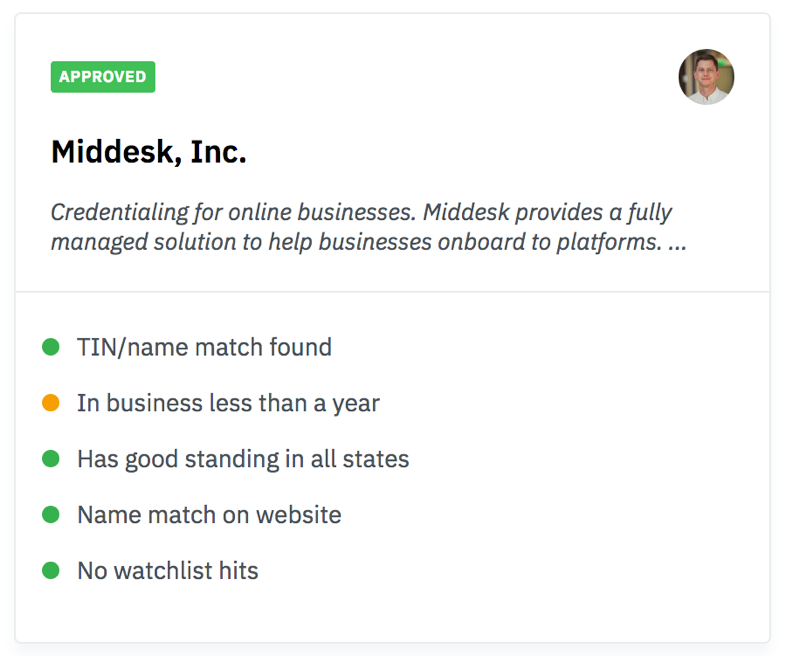 Enter Middesk — a suite of tools designed for B2B companies to “background check” their customers. We started Middesk because we saw, firsthand, the difficulty in establishing trust between businesses at scale. Our previous employer, Checkr, provides pre-employment background checks to thousands of companies, ranging from startups to the Fortune 500. Given the sensitivity of the data and regulation in the industry, Checkr needs to conduct due diligence on its own customers to make sure they are legitimate, active businesses, and that they have a specific and approved purpose for leveraging the Checkr product. Customer information would be captured through a form that we would host and would then be provided to a 3rd party vendor. The 3rd party would return known and associated business records, which would be reviewed and filtered down to focus on only the relevant business details for our customer. All records would be reviewed against our business rules for determining the legitimacy and risk profile of that customer, we would take a decision on how to engage with that customer, and update their status. All 3rd parties rely on their own internal dataset. If they did not already have data about a customer, we would need to fall back to a manual review process. This would happen ~20% of the time and would be especially challenging when dealing with SMBs and startups where there is minimal business history. If we wanted an integrated solution, we would need to implement the vendor API, but would also need to build entity resolution and identity matching to manage false positives and negatives and a rules engine to apply our decision logic. Ultimately, the resource investment required to leverage 3rd party data was too great and given the number of other projects outstanding on the product roadmap, we solved this problem like many other companies before us — by adding headcount, changing the scope of our requirements, accepting our inefficient, yet functioning manual review process, and moving on to other projects. All businesses have a unique Tax ID that is tied to a legal name with the IRS. For clients that need to submit information to the IRS or other regulators, ensuring that they have accurate information on-file saves them from fines and additional legwork around tax season. We’re helping to ensure that when customers are onboarded, they provide our clients with accurate and trustworthy information about their business identity by capturing that information and verifying this directly through the IRS. 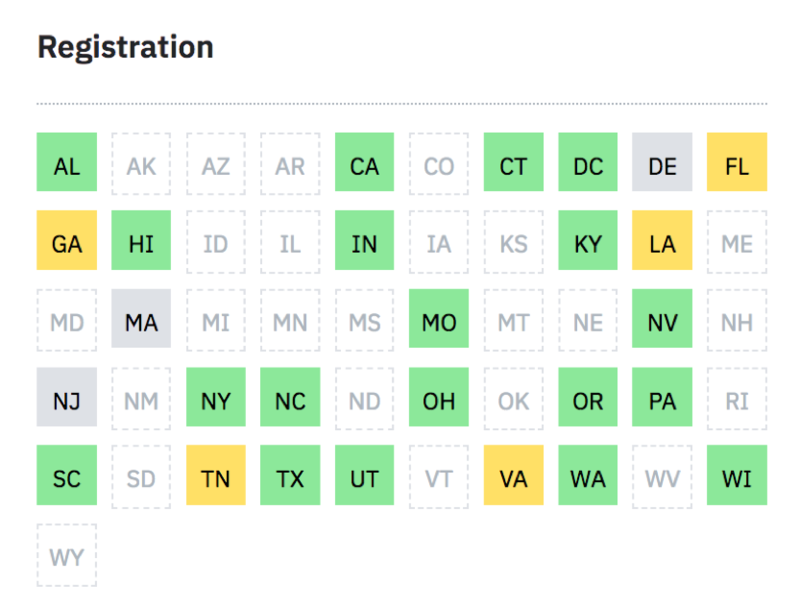 Companies need to register and maintain active status in states where they have employees, offices, or significant portions of revenue. Companies can fall out of active status if they dissolve their business or have trouble with the state, such as not paying their taxes. Each state is independent of the next and there is no single repository to verify that a business is an active business. We’re helping clients quickly understand the registration history and nationwide footprint of each of their customers so they can ensure they engage with businesses that are currently in, and remain in, active standing with the state. Websites are commonly used as a proxy for understanding the legitimacy and risk profile of a customer. Products or services are used to understand the nature of business for a customer, which is important in regulated spaces like payments, where payment processors are prohibited from supporting certain industries like cannabis. We’re removing subjectivity from the review of customer websites. To do this, we automatically surface key information and content about the web presence of our client's customers, flagging high-risk and relevant information. Reduce the average time it takes our clients to approve their customers for production access from 20 minutes to less than 2 minutes. Save a client thousands of dollars by reducing their reliance on costly state data access fees. Empower compliance teams with engineering resources, who otherwise would not have the resources available and would need to add headcount to scale output. While companies in Payments, Lending, Payroll, Expenses, and Credit all have regulatory risk requirements, all B2B companies can implement risk assessments similar to those conducted in these high-risk industries. In fact, some industries are seeing shifts that could change the way they manage their relationships with their customers. For example, The Honest Ads Act, if passed, will require all open advertising marketplaces to verify their business customers. Risk and Compliance Teams to meet their regulatory and compliance requirements more efficiently by consolidating workflows for capturing, verifying, and reviewing customer credentials. Developers that want to remove bottlenecks in the verification and due diligence process and are looking to integrate APIs that will just work. Finance teams that want to use customer intelligence to reduce business risk by setting and define credit terms and payment methods at scale. While we’re just getting started, we’re already driving meaningful business impacts for our clients. Over the coming months, we will be working to include workflow tools to help our clients capture and review business data, we will focus on data acquisition to surface litigation, bankruptcy, and payment history, and we will build data tools to help standardize and structure otherwise confusing and unusable data. In order to help us with this, we will be building a team of ambitious, curious, humble, and driven individuals that are excited to disrupt incumbent players in the space who have owned business entity data for decades. Come help us establish trust between the millions of businesses that engage online every day. Thanks to Will Saborio and Jack Altman.